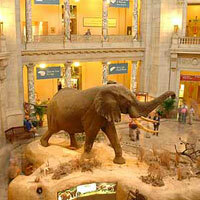 Washington, DC has amazing child friendly attractions that will entertain the entire family. When visiting the nation’s capital, consider these top 10 family friendly destinations. Click Here for tickets to top Washington DC Tours and Attractions. The National Air and Space Museum is the most popular of all the Smithsonian museums. The facility is home to the Wright Brother’s airplane and the Spirit of St. Louis. You can touch an actual moon rock. The hands-on, interactive displays and exhibits encourage children to learn about aviation and space exploration. The National Zoo displays approximately 2,000 animals from around the world, including giant pandas. Approximately 20 percent of its inhabitants are rare or endangered. The zoological park is one of the oldest in the nation. Children can watch animal shows, feeding sessions and keeper talks as well as attend various workshops. The Museum of Natural History launches children on a journey of discovery into the world around them. It is the most visited museum of its kind in the world. The planet’s largest diamond and life-size skeletons of dinosaurs will amaze children. Dioramas and interactive displays foster a child’s curiosity and quest for knowledge. The Museum of American History first opened in 1964. Children will be enthralled as the story of America comes alive before their eyes. Items on display include the original copy of the Star Spangled Banner. Various hands-on exhibits and touch stations highlight science and inventions throughout America’s history. The National Children’s Museum works in partnership with Sesame Street. It is designed so children can learn through play. Inside the 18,000-square-foot museum, activities and exhibits highlight the arts, health, citizenship and the environment. The National Children’s Museum teaches children about the world and inspires them to make it a better place. The International Spy Museum reveals fascinating espionage techniques, special equipment and the top-secret history of clandestine services from around the globe. More than 600 items are on display. You will learn about real life and fictional spies. Children can don an undercover alias and conduct their own secret mission. A Duck Tour provides a unique land and water tour of the nation’s capital. The vehicles are meticulously refurbished World War II amphibious trucks. These distinctive vehicles take passengers along the National Mall and then on the historic Potomac River. On-board guides provide informative and entertaining information about city landmarks. The Washington Monument is the tallest obelisk in the world. Its observation deck provides a bird’s-eye view of the city. Ride the elevator to the top for a unique perspective of the other monuments and historic buildings that line the National Mall. The amphitheater near the base of the monument is the venue for various open-air performances. The Bureau of Printing and Engraving is responsible for designing and producing our money. During a guided tour, children can watch as the money is printed, stacked and checked for imperfections. The bureau also prints documents, such as naturalization certificates, White House invitations and Treasury securities. The C&O Canal was once a major commercial transportation route. Today, it is a path of discovery into history and nature. Take a journey back in time as you climb aboard a replica, mule-drawn canal barge and marvel when locks lift the vessel. Costumed interpreters will share the experiences of people who lived and worked along the waterway.